Dole Listeria Lawsuit Help – The Weinberg Law Firm is currently assisting victims of the Listeria outbreak linked to eating recalled Dole packaged salads. We are ready to help you too. If you or a loved one contracted listeriosis after eating a Dole recalled salad and you would like to learn about your legal rights, please contact The Weinberg Law Firm for a free legal case evaluation at 1-877-934-6274. Dole Listeria Outbreak Update, 3 New Cases Are Confirmed – The U.S. Centers for Disease Control and Prevention (CDC) announced that a total of 19 people were infected with the life-threatening pathogen Listeria, in a food poisoning outbreak that may be linked to Dole packaged salads processed at the company’s Springfield, Ohio, facility. This outbreak has been found over 9 states. The number of ill people reported from each state is as follows: Connecticut (1), Indiana (1), Massachusetts (1), Michigan (4), Missouri (2), New Jersey (1), New York (6), Ohio (2) and Pennsylvania (1). The outbreak victims range in age from 3 years to 83 years, and all 19 required hospitalization according to the CDC. Tragically, one fatality in Michigan has been linked to the outbreak. One of the illnesses reported was in a pregnant woman. According to the Public Health Agency of Canada, seven people in five Canadian provinces were also infected with the same outbreak strain of Listeria. The recalled Dole packaged salads were distributed in Eastern Canada as well as in the United States. 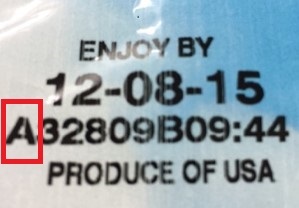 Salads can be identified by the letter “A” at the beginning of the manufacturing code found on the package. On January 22, 2016, Dole Fresh Vegetables, Inc., announced that it had stopped all production at its processing plant in Springfield, Ohio, and that the company would withdraw the following brands of packaged salads from the market: Dole, Fresh Selections, Simple Truth, Marketside, The Little Salad Bar, and President’s Choice Organics. The packaged salads can be identified by the letter “A” at the beginning of the manufacturing code found on the package. The CDC also advised that consumers do not eat, restaurants do not serve, and that retailers do not sell packaged salads produced at the Dole processing facility in Springfield, Ohio. Please see Dole Packaged Salads Recall for CDC announcement and consumer advice. Using laboratory techniques known as pulsed-field gel electrophoresis (PFGE) and whole genome sequencing (WGS) public health scientists from each state generate “DNA finger prints” for bacterial specimens collected from food poisoning patients nationwide. This network of testing laboratories and the resulting database of bacterial DNA information is known as “PulseNet.” PulseNet enables public health investigators to identify potential food poisoning clusters (outbreaks), and to link individual food poisoning illnesses to an outbreak. If a foodborne pathogen or bacteria is eventually isolated from a suspected outbreak food source, DNA finger printing and the PulseNet database can also be used to link that food to an outbreak. Identifying the outbreak victims – By using WGS, public health scientists determined that the Listeria specimens, isolated from all 15 of those sickened, are highly related genetically. In other words, these 15 patients are victims of the same food poisoning outbreak. Interviewing patients about the foods they ate prior to becoming ill also provided valuable information. Investigators learned that eight of the eight outbreak victims who were asked about packaged salad reported eating packaged salad in the month before becoming ill. Four of four outbreak victims who reported the brand of salad that they had eaten, identified the brand as Dole. Linking Dole salads to the outbreak illnesses – The CDC reported in its initial outbreak announcement, that the Ohio Department of Agriculture collected a Dole brand Field Greens packaged salad from a retail location and isolated Listeria from the product. This packaged salad was produced at the Springfield, Ohio, Dole processing facility. In January 2016, WGS indicated that the Listeria isolated from the packaged salad, was highly related genetically to the Listeria isolates from those sickened. This information linked the illnesses to Dole brand packaged salads produced at the Dole processing facility in Springfield, Ohio. The Public Health Agency of Canada also confirmed the presence of the Listeria outbreak strain in packaged salads produce at the Dole Springfield, Ohio processing facility. Listeria infection, or listeriosis, is a serious and sometimes fatal foodborne illness caused by eating food contaminated with the bacterium Listeria monocytogenes. Listeriosis affects primarily pregnant women (and sometimes their developing fetuses), newborns, older adults, and adults with weakened immune systems. However, persons without these risk factors can also be affected. Please see Listeria to learn more about Listeria symptoms and diagnosis. The Weinberg Law Firm is currently assisting victims of Listeria food poisoning outbreaks nationwide, including those injured in the recent multistate outbreak that may be linked to eating Dole salads. Please contact our law firm 24/7, toll free at 1-877-934-6274, if you have a question regarding a Listeria food poisoning lawsuit.